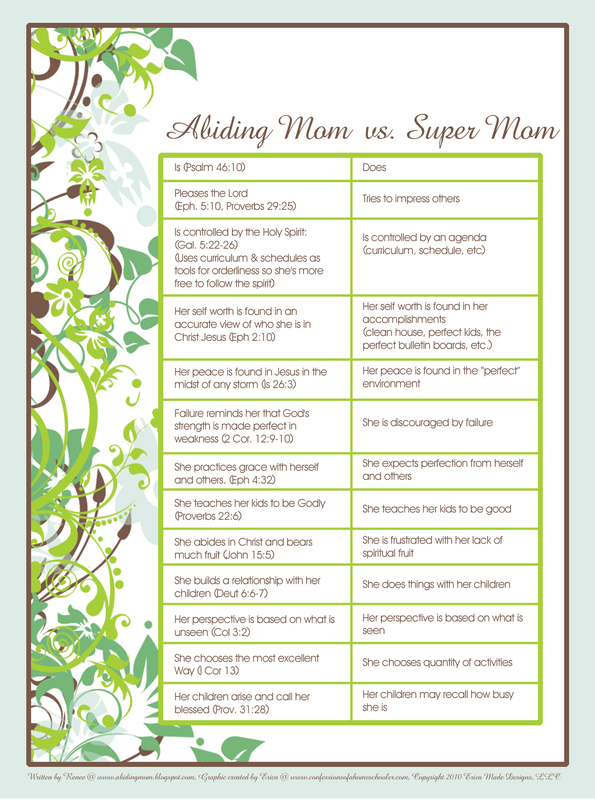 Today I want to share with you the difference between an Abiding Mom and a Super Mom. It was written by my good friend Renee a few years ago, and with her blessing, I created this printable to share with you all! I am daily convicted by this chart, and use it as a reminder to keep my priorities in line with God’s priorities. I pray it will bless you as well! I pray you all have a blessed day as you seek to abide in Him! This is very encouraging. Thanks for sharing. So timely!! Thank you for this!! wonderful! I really needed to see this today! I am going to share it with my Mom's bible study on Thursday. We are currently doing a study on the proverbs 31 woman. Which sometimes feels like she is super woman! This is incredible, and very timely. Thank you for sharing. Thanks for posting these! I'm going to put a few of the Bible verses on my fridge, and tuck a few into my Hubby's luggage (he's leaving on a mission trip to Belize on Friday). Thank you for sharing this! I will be printing this out and hanging it where I can see it daily. Awesome!